My Online Kitchen-Indian Veggies: Akshaya Thrithiya Special! Method Melt ghee and fry besan in it till a nice smell comes out. Transfer the mixture in another vessel and mix with milk powder. Make thick sugar syrup Drop the fried besan mixture in sugar syrup and stir it. Transfer it to a greased plate. Cut into diamond shaped pieces or you can even just make it into small balls or laddoos :) Besan burfi is ready. Add water to the sugar. Put for boiling. When the sugar melts, add kaju powder. Keep stirring on a low flame. When bubbles start emanating from the bottom and when the mixture tends to flow out of the vessel, put off the heat. Roll the mixture between two polyethylene sheets into a 1/2" thick roti. Remove the upper sheet and allow the roti to cool. Cut into pieces of desired shape and size. peel and cut Mango in small pieces. Mix condense milk and curd ,beat till smooth. Add crushed nuts and cardamom powder in this curd . Add mango pieces in this mix. If you feel its not sweet enough ,you may add some sugar . Mix well and chill 1/2 an hour before serving. Place a heavy pan on low flame and put gulkand into it. You can even add 4-5 fresh red-rose petals to it. Stir gently for a while and when you see soft lumps form, remove from the flame and leave it aside to cool. Now mash the khoya with your hand. Apply some ghee to grease your palms and mash the khoya well so it becomes soft and smooth. Add powdered sugar and mix it well. Put the mixture in a large non-stick pan, add 2 tbsp ghee and heat it on high flame for 2-3 minutes. Now heat it on low flame, stirring continuously. Once you see it take a light-brown color and the ghee starts separating at the edges of the pan, remove from flame. The sugar will leave water, so the mava consistency should be thick yet granular and soft. If you think it is too dry, add 2 more tbsp ghee to it. Now add cardamom powder and mix well. Take a small portion of the mixture, around 1/4th, in another pan, add the gulkand to it and stir to make a red-colored mawa mixture. Now keep the 2 mixtures separate and allow it to cool till you can manage it with your hands without scalding your skin. Take half of the white mixture and spread it on a greased plate with edges. Then spread the red gulkand mixture on top of it, and put a third layer of the white mixture right on the top. Garnish with slivered almonds or pistachios and silver varakh. 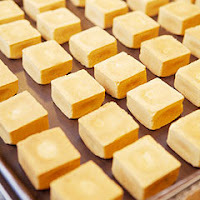 Once the mithai sets a little, make small bite-sized squares using a blunt knife, then set it into the refrigerator for about 10 mins. Remove from the fridge, cut the sqaures and remove them from the plate and store them in an air-tight container. You can preserve this sweet for 4 to 5 days in the fridge. Serve this beautiful gulkand burfi to your guests and spread the spirit of friendship and love!